Welcome to Long Island’s first excursion business of its kind. Whether it’s a fishing trip for a novice or a pro, or a day out with the family and a bbq on the beach, let us show you a trip to remember. Come see Long Island in a new and exciting way – from clamming to a hook & cook excursion. Come fish the best grounds and most beautiful waters Long Island has to offer. As a new business located in Center Moriches, Long Island we believe we have what it takes to create a private, customized, unique experience you won’t soon forget. After all, the beauty of the water & beaches speak for themselves. Our natural surroundings are what we thrive for every day in the summer on Long Island. From its waterfront bayside homes, to the world renowned white sand ocean beaches just off our South Shore barrier beach. If you prefer a Fishing Trip, a Scenic Sunday Brunch, a Hook & Cook experience, or a Romantic Sunset Cruise with fine table fare, we have just the trip for you. Our private excursions are not to be missed. We also offer customized packages, so tell us what you like to do and we’ll create it for you. Come visit this beautiful place. You need to see it! Let us pamper you on our beach excursions. Upon arriving, you may walk up to the beach and we’ll bring all that is required for a fun-filled day. We can also provide beach umbrellas and beach chairs. All you need to bring is a towel and suntan lotion. This was the first fishing charter I ever went out on! I always wanted to learn how to fish but I didn't know how to teach myself and I didn't have anybody to teach me. Finally I saved up and went out on the sea for a day with my best friend. The crew was awesome working with both of us, and we actually caught some fish!! It was really a cool experience, and we can't wait to try it again. My kids were visiting me for the first time in six months following a horrible divorce dispute, which I finally got resolved in my favor. Sort of. Anyway, I really wanted to have some fun with them since it had been so long since we'd been able to spend time together, and they'd been through a lot. So I chartered a fishing cruise with Fun in the Sun. I was really excited when I found out that they work with all age groups, and my kids had always wanted to learn about fishing. We had a blast together, and it was a great way to spend time together after all that had happened. Very relaxing and exciting all at the same time. It was fun seeing Long Island from the sea too! I don't get out on boats too often, and it's always a pleasure. The crew were so friendly, and I hope we can do it again soon. Our relatives flew in from Dallas last week and we wanted them to experience the beauty of Long Island the fun of fishing! None of them had a clue how to fish, but they wanted to see what it was like. So we got a charter with Fun in the Sun and everyone had a blast! They were equally great working with our relatives (total fishing newbs, as I mentioned) and us (we've been fishing LI waters for years now). I like that they were able to deal with multiple skill levels in one excursion. My uncle was so excited when he caught his first fish! Fun in the Sun is Long Island’s first excursion business and it does deliver under all fronts. We are regulars to NYC and head here from Dallas to move around with élan. Our first stop shop is certainly Fun in the Sun as we love moving about on their fishing excursions. We cannot recommend them more and urge you to visit them once and bask in the glory of having a unique charter ride. Fun in the Sun Excursions and Fishing Trips can make an ordinary Sunday seem perfect and stay memorable in your mind for a long long time. We had chosen a fishing trip with some colleagues and we were excited by the thrill that they gave us. Thescenery where we went fishing was absolutely enchanting. There were people who guided us at the most probable place to catch a fish to be proud of and indeed we did! The fish were well sized and the boat was fantastic. We did not even understand how time went by so quickly and we were only alerted by the sunset, which was the perfect ending to a great Sunday by the sea. I totally recommend Fun in the Sun for any excursion. Fun in the Sun makes for an awesome fishing experience. I recently went trout fishing with them, my family in tow and we were overjoyed with the catch! Of course, they are priced high but, in the end a relaxing holiday makes the splurge well worth. Am I happy? – Most certainly! My kids’ smile made my day in the end. I wholly recommend them for fishing and waterway trips. They are a fabulous service and really friendly. Really had a good time when we went with Fun In The Sun Excursions & Fishing Charters. We were catching more fish then we could possibly need so we even threw a couple of them back. Had a blast when capt took us over the blue fish. 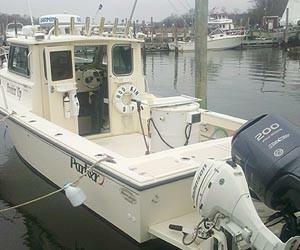 Really a quality fishing boat that takes care of there customers. If you're not catching anything for a few minutes he quickly moves to a new spot. Very Highly recommended. Do you have any experience using Fun in the Sun Excursions & Fishing Charters? If so, please rate your experience and let others hear about it using the form below.